Tiered deck plans are similar to the multi-level style and are another great option for homeowners who have built their house on a sloping lot. With the change in the slope of the land, the deck follows the height changes and provides segments for outdoor enjoyment. This style may have many separate outdoor living spaces at different heights, perfect for a dramatic look for any outdoor setting. They can be built to fit any lot situation and can be constructed at any height. They are a flexible and highly functional solution for any backyard. 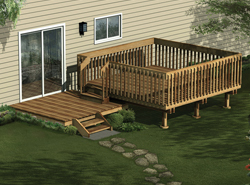 Our collection of tiered deck plans includes many styles and sizes perfect for making your outdoor area just perfect. We offer detailed drawings that allow the buyer to visualize the look of the entire finished project, down to the smallest detail. With a wide variety of plans, we are sure that you will find the perfect do-it-yourself project to fit your needs and style.